Click the Choose your region link. Enter the name of the city where your store is located and click "Save." Next, go to the Delivery Rates and Terms settings. Attention. You are allowed to change your region at any time before moderation. After moderation is performed, you can only change your region by contacting the Customer Support Service. Click the To add a new region button. Include all areas, regions, districts and municipalities where the same delivery terms apply. Note. By default, each area includes all the localities inside it. Enter the name of the region in the field under the settings and click the Save and continue button. Restriction. 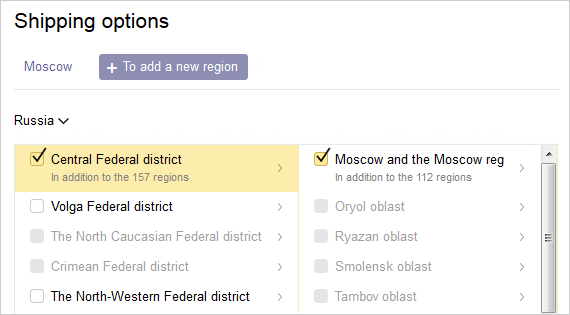 You are not allowed to create more than 20 regions. Each locality (area, region, district, etc.) may only be included in one region. Next go to the Delivery Rates and Terms settings. If you do not provide any information about delivery rates to other regions, just indicate the courier services that you use.